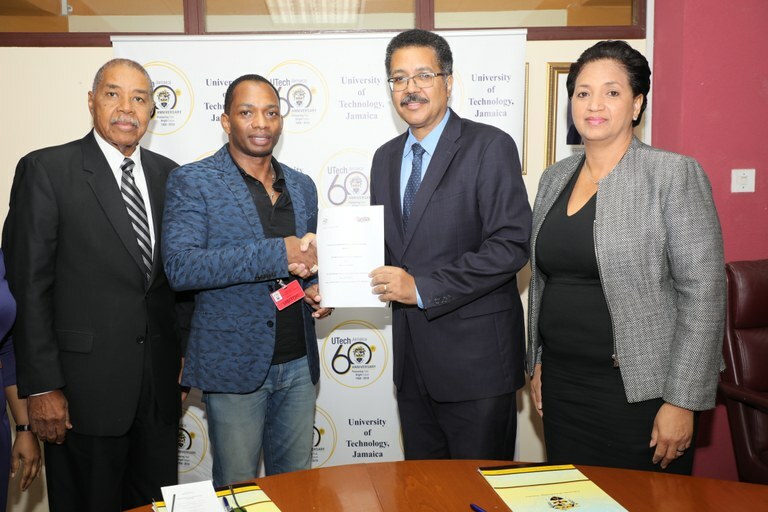 UTech, Jamaica and Elhydro Limited Sign MoU for Biodiesel Production and Research — UTech, Ja. Professor Stephen Vasciannie (1st right) President, University of Technology, Jamaica and Mr. Phillip Scott (2nd left) President Elhydro Limited display a copy of the Memorandum of Understanding signed between the two institutions at a ceremony held at the University’s Papine Campus on Tuesday, October 2, 2018. Sharing in the occasion are Mr. Sam James, (left), Executive Vice President, Elhydro Ltd and Professor Nilza Aples, (right), Dean, Faculty of Engineering and Computing, UTech, Jamaica. The extraction and processing of Castor oil, Waste Vegetable Oils (WVO), and Meat/Chicken fats to biofuels to meet the ASTM D6751 and/or European EN 14214 fuel testing standards. Biodiesel application in Diesel engines which has many important technical advantages over conventional diesel such as lubricity, low toxicity, superior flash point, negligible sulphur content and lower exhaust emissions. Bi-products production, e.g. Fertilizer meal, Glycerine and Pharmaceuticals. Professor Stephen Vasciannie thanked all persons within the Faculty of Engineering and Computing led by Professor Aples, who are lending their expertise to the realization of the outcomes of the partnership with Elhydro. The President also thanked the Petroleum Cooperation of Jamaica for its contribution IN bringing the two intuitions together, noting that “UTech, Jamaica and the PCJ have enjoyed a very productive and long-standing partnership on initiatives aimed at capacity building in engineering education, scholarship and research." Partners from UTech, Jamaica, Elhydro Limited, The Petroleum Corporation of Jamaica (PCJ), the Ministry of Science and Technology and the Jamaica Castor Industry Association (JCIA) pose for a group photograph following the MoU signing ceremony. (L-R, front row) Dr. Therese Chambers, Head, School of Engineering, Faculty of Engineering and Computing (FENC), Mr. Noel Perrier, member JCIA, Dr. Claire Sutherland, Senior Director, International and Institutional Linkages, UTech, Jamaica, Mr. Phillip Scott, President Elhydro Limited, Professor Stephen Vasciannie, President, UTech, Jamaica, Professor Nilza Aples, Dean, Faculty of Engineering and Computing, Miss Paula Henry, Programme Director, Chemical, Agricultural and Biological Engineering, School of Engineering, FENC and Mr. Horace Buckley, Director of Project Management, Ministry of Science and Technology. (2nd row L-R) Dr. Peter Ruddock, Manager, Renewable and Energy Efficiency, PCJ, Mr. Sam James, Executive Vice President, Elhydro Ltd, and Mr. Douet Stennett, Director, Regulatory Affairs, Ministry of Science and Technology.